Apple owns the trademark to "There's an app for that" for a good reason — there seems to be an app for almost everything. There isn't an app for organizing all the apps you download from the App Store, however, so if you love to take advantage of every download-for-free promotion that comes your way, you will soon need to organize your apps rather than just letting each new app go to the back of the line. When the iPad was introduced, it didn't include a way to create folders, but this feature soon emerged as an important tool for curating apps on the device. The process of moving an app into a folder is simple as moving an app, but instead of dropping the app on an open area on the iPad's Home screen, you drop it onto another app. Tap and hold on an app that you want to put in a folder. After it starts to jiggle, drag it over another app you want to put in the same folder, but don't release it. As you continue to hold the app, you zoom into a folder view. Release the app. Add a name to the folder if the generic name the iPad chooses isn't the one you want to use, by tapping in the name area. The iPad recognizes types of apps, so if you create a folder with two weather apps in it, the name will be Weather. Click off the folder and back on the Home screen. Now you can click, hold, and drag additional apps into the folder. Make several folders to hold your apps. People often create folders for games, productivity apps, entertainment apps, financial apps, and so on. If you don't end up using a particular folder, drag all the apps in it out to the Home screen, and the folder disappears. The apps on the dock at the bottom of the screen stay the same no matter which Home screen you are currently on, so this area is the best place for your most-used apps. Many of us never change out the apps on the dock, but you can put up to 13 apps on the dock, so there's plenty of room for you to personalize your dock experience. After the first half dozen, the app icons shrink to make room for additional app icons. The dock displays the three most recently used apps automatically, so even if you don't have an app docked, it may be ready for you to launch from the dock if you have opened it recently. You place an app on the dock the same way you would move it anywhere. Press and hold on the app until it jiggles. Move your finger and the app to the dock and hold until the other apps on the dock move out of the way. If your dock is already full or if you decide you need one of the default apps on the dock, move apps off the dock just as you would move them from anywhere. When you move the app off the dock, the other apps on the dock reposition themselves. One of the coolest ways to organize your iPad is to flip the script. While the dock is intended for your most-used apps and the Home screen is intended for your folders and the rest of your apps, you can use the Home screen for the most popular apps and the dock for everything else by filling the dock up with folders. 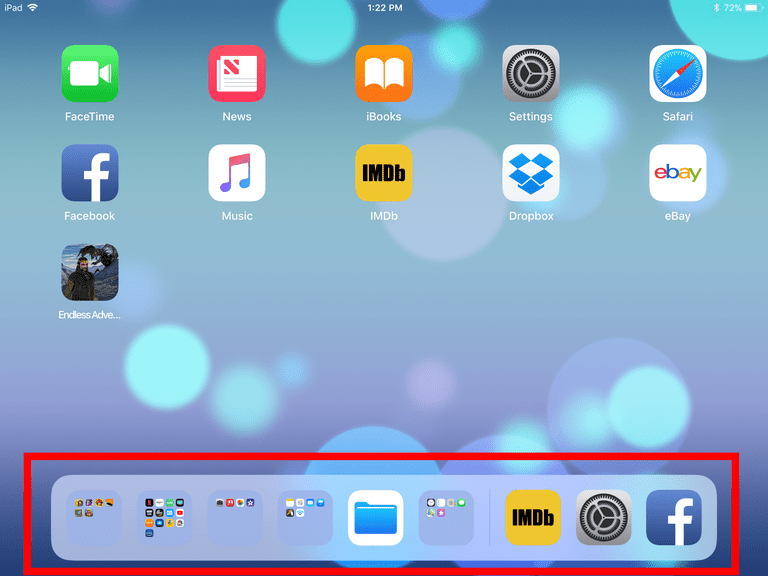 Placing a folder on the dock is a great way to access a whole slew of apps from any Home screen. So, instead of using the dock for apps you want to get to easily, you leave them on the first page of your Home screen and put all your other apps in folders on the dock. There is no way to keep your apps permanently organized alphabetically, but you can sort them without moving each app using a workaround. Go to General on the left-side menu and choose Reset at the bottom of the General settings. Tap Reset Home Screen Layout and confirm your choice on the dialog box that appears by tapping Reset. This procedure sorts all the apps you have downloaded in alphabetical order. They appear immediately behind the default apps, which are arranged in the same way they were when you got the iPad. Apps you download later are not alphabetized; they appear at the end of the apps as usual. If you download dozens of new apps each week, the basic organizing tips for the iPad may not be sufficient to keep your iPad easy to navigate. That's OK because you can launch any app at any time using Spotlight Search, which you find by swiping right from the first Home screen. You don't have to hunt for an app. The tool offers a search field and several suggestions for recently used apps. Another easy way to launch an app is to use Siri. Press and hold the Home button to launch Siri and then say Launch Notes or Launch Mail or whichever app you want to open.